MPs have backed legislation banning the use, production and transfer of cluster munitions in the UK and by UK nationals. 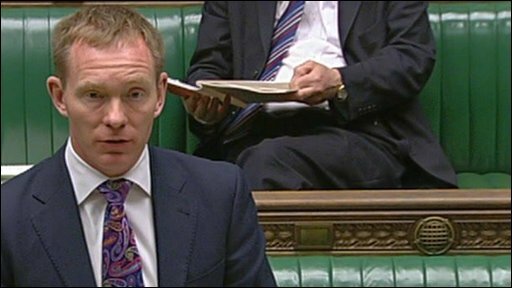 Opening second reading debate on the Cluster Munitions Bill on 17 March 2010, Foreign Office Minister Chris Bryant told MPs: "What we want to see is a world without cluster munitions." He urged all countries to sign a convention banning the use and production of the weapons, which have killed many thousands of people across the world. Britain has signed the Oslo Convention on Cluster Munitions, which prohibits the use, production, stockpiling and transfer of cluster bombs - but non-signatories include the US, Russia, China, Pakistan and Israel. Cluster munitions are explosive weapons that eject a collection of smaller bomblets, many of which are not detonated until a civilian walks nearby or picks it up. Mr Bryant said: "Some 60% of those who have been killed or injured have become casualties while in the ordinary business of their daily lives rather than in military activity. "A third of those who have been killed or injured have been children." Shadow foreign secretary David Lidington welcomed the Bill and the "humanitarian objectives" that lay behind it. He said cluster bombs were often responsible for "hideous injuries" among the civilian population. But he also asked if banning such weapons would "impair" the effectiveness of the armed forces in any way, putting soldiers "at risk". Liberal Democrat spokeswoman Jo Swinson praised the UK for taking a lead on banning the "vile and indiscriminate" weapons. She said the number of innocent civilians killed by cluster bombs makes them "unjustifiable". They are also "counter-productive" in the battle to win hearts and minds, she added.